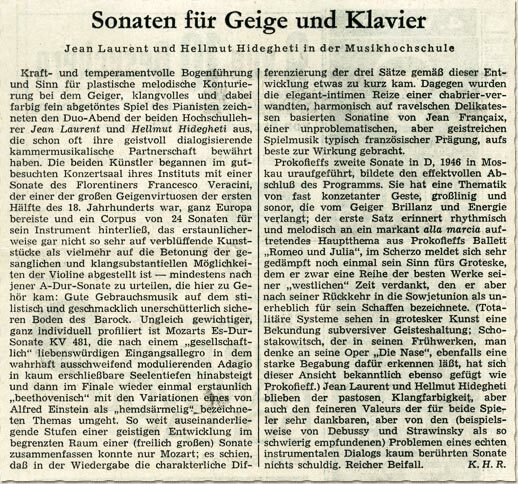 … the audience enjoyed it greatly and applauded the hot romanticism, feverish from the allegro moderato; the phrasing of the adagio, which soloist Mr J. Laurent … caused to resonate from the depths of his soul with a moving purity; and finally the lively, spirited finale to colourful, rhythms full of verve. The cycle of Beethoven sonatas for violin and piano are continuing to attract a very big audience. 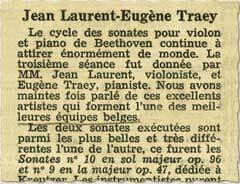 The third session was given by Jean Laurent, violinist and Eugène Traey, pianist. We have on many occasions talked about these excellent artists who form one of best duos in Belgium. The two sonatas performed are among the most beautiful and they differ a great deal from one another. They were Sonata no. 10 in G major, Opus 96 and no. 9 in A major Opus 47, dedicated to Kreutzer. The instrumentalists were able to demonstrate the entire cadence and it was outstanding. The earnest and spirituality, the intelligence and culture of these artists are well known. Everything is well-reflected, finely tuned, and yet their musicality remains absolutely natural. The nuances in the magnificent Adagio in the Sonata in G were expressive and the Scherzo light and merry. 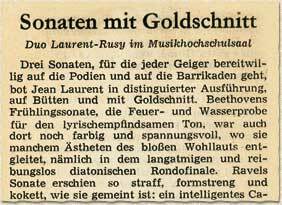 The impression left by the famous Kreutzer Sonata was even better than the previous one. It was appreciated as much for the accentuated confidence, the passionate fugue as for the subtlety, the vivacity and the animation. In short, all this was in good balance and with appropriate feeling and understanding. Virtuoso violinist Jean Laurent and pianist Hellmut Hideghéti gave a perfect recital of the three sonatas for violin and piano by Johannes Brahms to a respectable audience in the Mozart Hall. As an introduction to this delightful evening the two artists played the Second Violin Sonata Opus 100. Written in the light A Major key, it expresses a distinctly sunny mood. The antithetical inner nature of the three themes in the first movement was presented in a pleasing form. The characteristic singing and rhythmic style of the simple theme of the Andante tranquillo was performed clearly and the wonderful crescendos of the finale were rendered in unparalleled beauty. The master’s first sonata, Opus 78 in G Major, formed the heart piece of the concert. Rapturous and soft, this work is nevertheless without excessive sentiment. And this interpretation was played ideally to the unmitigated joy of those listening. The third sonata, Opus 108 in D Minor, formed the transition to the realm of concert sonatas. The impact of this technically ambitious work matches the great emotional suspense. The sonata unfolded with congenial mastery before the thrilled audience. Jean Laurent is a violinist of international stature who always produces a melodious sound, clear intonation and virtuoso bowing. The rich spectrum of touch of which the pianist, Hellmut Hideghéti, is capable puts him absolutely on a par with his partner in terms of his charisma as an artist. The audience was enraptured and rewarded them with sincere applause. The powerful, spirited bowing and a feeling for vivid melodic definition on the part of the violinist and the melodious, colourful, finely pitched playing of the pianist characterised the evening recital given by the two university professors Jean Laurent and Hellmut Hideghéti, who have already frequently proved their ability to conduct a brilliant dialogue in their chamber music partnership. At the well-attended concert in the concert hall of their institute the two artists began with sonata by the Florentine, Francesco Veracini, who was one of the greatest violin virtuosos in the first half of the 18th century. He travelled all over Europe, leaving an oeuvre of 24 sonatas for his instrument. Astonishingly, its main concern was not to perform amazing musical feats but rather to emphasise the singing and the potential substance of the sound of the violin – at least if one goes by the sonata in A Major, which was heard this evening. It was good music to listen to, founded as it is on steadfast Baroque terrain with regard to style and taste. 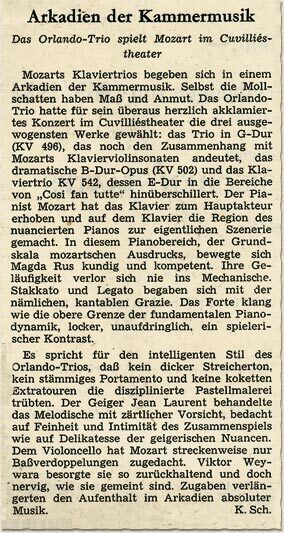 By contrast, Mozart’s E-flat Major sonata (KV 481) is far more ostentatious and with a more individual profile. 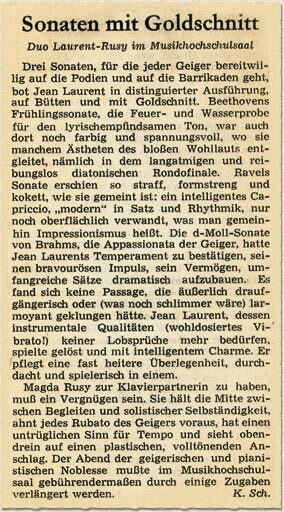 Following a pleasant, “social” Allegro it plunges into the unfathomable depths of the soul in the truly extravagantly modulating Adagio, then again in the finale, it treats the variations on one of the themes that Alfred Einstein terms “shirt-sleeved”. Mozart alone was capable of combining stages of intellectual development that lie so far apart in a single (albeit great) sonata; it appeared that in this rendition the differentiations in the characters of the three movements were somewhat neglected. 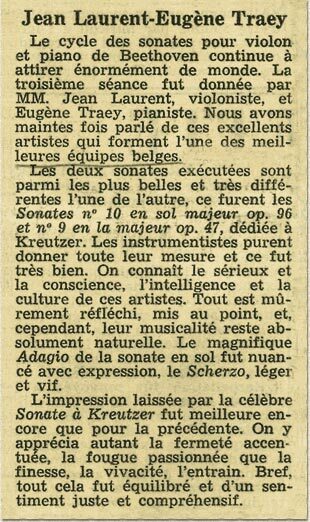 By contrast, the elegant, intimate appeal of a sonata by Jean Françaix, akin to Chabrier, harmonious and based on Ravelian delicacies, an unproblematic but – typically French – intellectually stimulating music to play, was performed with excellent effect. Prokoview’s second sonata in D, first performed in Moscow in 1946, provided an effective close to the programme. Its thematic invention is almost a concertante gesture, with generous contours and sonority, requiring brilliance and energy on the part of the violinist. The rhythm and melody of the first movement are reminiscent of a main theme from Prokoview's ballet "Romeo and Juliet" that presents itself strikingly alla marcia; in the Scherzo his sense of the grotesque - to which he owes a number of his best works from his “Western” period, but which, after his return to the Soviet Union he described as being of little importance for his creativity - returns again, much subdued. (Totalitarian systems see grotesque art as a manifestation of a subversive mental attitude. Shostakovich, who in his early works – remember his opera “The Nose” – also showed a distinct aptitude for it, like Prokoview also bowed to this point of view, as we know). 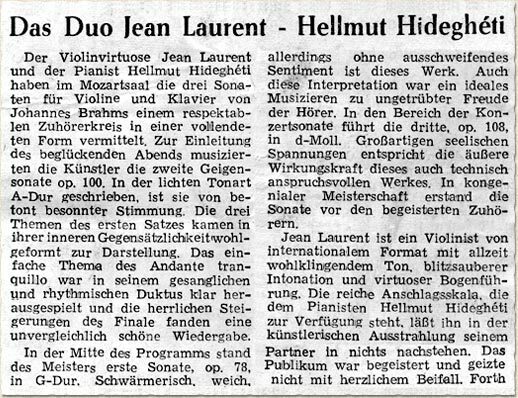 Jean Laurent and Hellmut Hideghéti did full justice to the pastos timbre as well as to the finer worth of the sonata which was very favourable for the two artists, but a composition virtually unaffected by the problems of genuine instrumental dialogue (which Debussy and Stravinsky experienced as most difficult). The applause was abundant. K.H.R. Jean Laurent presented a distinguished rendering of three sonatas for which any violinist will happily climb onto podiums and barricades, luxurious and gilt-edged. Beethoven’s Spring Sonata, the ordeal by fire and water for the sensitive lyrical tone, remained colourful and full of excitement in passages where some aesthetes concerned only with melodiousness lose their grip on them; namely in the long-winded and smooth diatonic Rondo finale. Ravel’s sonata came across as just as tight, strictly formal and coquettish as it is intended to be: an intelligent Capriccio, modern in movement and rhythm, now only superficially related. This is generally known as Impressionism. Brahms’ D Minor and the violinists’ Appassionata had to be affirmed by Jean Laurent’s temperament, his brilliant impulses and his ability to build up complex movements. There was not a single passage that was overtly lachrymose [which would be even worse]. Jean Laurent, whose instrumental qualities (finely-dosed vibrato) require no more words of praise, played in a detached manner and with intelligent charm. He has an air of almost serene superiority, sophisticated and playful at the same time. Having Magda Rusy as your partner on the piano must be a pleasure. She steers a course mid-way between accompaniment and the independence of a soloist. She anticipates every Rubato by the violinist, has an unerring sense of tempo and, what’s more, she pays attention that her touch is expressive and full of resonance. The evening of supreme violin and piano playing was, of course, appropriately extended by several encores. The first piece on the delightful programme was a Haydn Trio in C, which proved that the sound of the spinet or piano at the end of the 18th century was far less voluminous than today, which can make it fairly difficult for modern-day pianist to cope with the finely defined strings if the piano score is not played with the kind of delicate virtuosity that Magda Rusy displays. What makes Ravel’s music seem so exceptionally fresh is its intelligence which, unlike sound and form never goes out of date. The Trio, played with delicacy and verve, therefore sounds as if it were being performed for the first time in spite of the fact that the language of this sound is so familiar. With Mendelssohn, too, it is the intellectual aspect and an acute sense of art that lend a work like the C Minor Trio the magic of imminence. Mendelssohn’s elfish spectre in the scherzo and the appassionato finale, interpreted with devotion were unfailing guarantees for rousing effects. Great jubilation and the Andante grazioso from the Brahms Trio in C Minor as an encore. The Orlando Trio plays Mozart in the Cuvilliés theatre. Mozart piano trios take their place in an Arcadia of chamber music. Even the minor shades display moderation and grace. 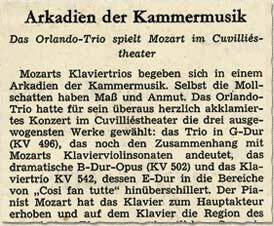 For its extremely heartily acclaimed concert at the Cuvilliés Theatre the Orlando Trio had chosen the three most balanced works: the Trio in G Major (KV 496), which still contains hints of the connection to Mozart’s sonatas for piano and violin, the dramatic B flat Major Opus (KV 502) and the Piano Trio (KV 542) where the E Major shines through into the realms of "Cosi fan tutte". The pianist Mozart has made the piano the main actor and turned the nuanced scope of the piano into the actual scenery. In this piano range, the fundamental scale of Mozart’s expression, Magda Rusy played with skill and competence. Her fluent playing never became purely mechanical. Staccato and legato proceeded with the necessary chanting, graceful quality. The forte sounded like the upper limit of the fundamental dynamics of the piano, light, unobtrusive, a playful contrast. It speaks for the intelligent style of the Orlando Trio that the disciplined pastel colouring was not dimmed by a heavy string sound, a hefty portamento or any coquettish special extras. 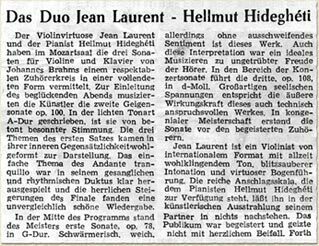 The violinist, Jean Laurent, treated the melodic element with tender caution, intent on the fineness and intimacy of playing together and the delicacy of the nuances of the violin. In some places Mozart assigned the cello the function of doubling the bass part. Viktor Weywara performed this function with such restraint and yet with the intended sensitivity. The Arcadia of music in its absolute form was prolonged by the encores.